Designed in every respect to meet the demands of full-race enthusiasts, the Super Challenge system provides not only all the benefits of a true racetrack-specific brake system, but also the durability and easy maintenance of Rotora®’s current line of Street Challenge Brake Systems. These competition kits are equipped with Rotora®’s all-new Super Challenge lightweight forged 2, 4, 6 and 8-piston caliper versions. Constructed of higher strength aerospace aluminum alloy compared to Rotora’s current street application calipers, these full-race calipers are engineered to provide a 15% reduction in weight without losing stiffness and performance. 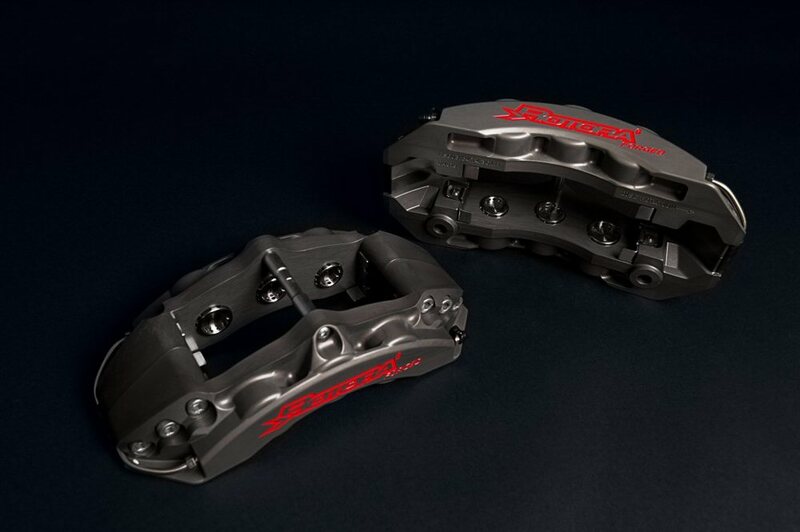 Unique to the Super Challenge Calipers are the ventilated titanium piston inserts as heat barriers and anti-knockback springs loaded behind each piston to counteract pad knockback; that is demanded when it comes to hard cornering and braking on the track. Rotora® Super Challenge Brake System is also equipped with full-floating 2-piece constructed disc system using Rotora’s Extended Float Drive mounting hardware. These larger disc rings come slotted-only, heat-treated, with Rotora®’s new directional staggered-design vanes to increase air flow, thermal capacity and heat dissipation. Caliper mounting brackets (7075-T6) and hats are constructed of billet 7075-T6 aluminum aerospace grade to further reduce unsprung weight. A set of Rotora®’s new formulated H9 or H10 Carbon-Metal pads for endurance/sprint race comes preloaded to deliver high fade resistance with excellent bite stop after stop. Rotora®’s Super Challenge calipers and billet aluminum hats use an exclusive natural anodized finish, making them impervious to discoloration at extreme temperatures experienced in racing. DOT compliant stainless steel braided brake lines are also included to provide quicker pedal response with consistent brake pressure. Together as a unified system, all the features produce shorter stopping distances, optimum brake modulation, firmer pedal feel, and less brake fade to achieve an all-around balance between durability, reliability, and controllability.